High precision costs more money in any product you buy. Unfortunately most customers do not see value in tooling. The only value of concern is in the finished product. That most customers are ONLY concerned with the finished part as opposed to verifying the quality of the tooling and/or the ease of molding process. Most Sourcing/Purchasing people as well as the Product Designers/Engineers never get to lay eyes on the tooling they purchase in order to draw any conclusions on quality or precision aspects of tool features-----especially if tools are located in other countries. For those of us that have had overseas assignments specific to managing tool builds and production startups I can attest to the fact that if you are not on site it is highly probable that shortcuts WILL BE taken by the mold maker and molder to cut costs and time. When a High level of Precision is required in a tool-----for moving parts, such as Lifters and Slides, the tool designer (as well as the Toolmaker) must consider material selection and hardness along with thermal expansion allowances on critical fits. It is those details that can only be verified by the most experienced tooling personnel as a Bench inspection with the tool apart. 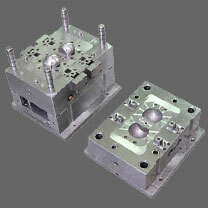 To attempt to qualify mold tooling mounted in a press is only a partial inspection at best. Does the customer pre-approve tool designs? Or have the expertise to do so? I have witnessed many "Precision" tools freeze (Lock Up) during the first few cycles of startup because TCE (expansion) of components when heated caused galling. My point being that Precision Fits must also consider the dynamics of the molding process involved. When molding high temperature resins the TCE can be quite a significant dimension, and of course this is a linear factor, so for larger parts, larger allowance. Cooling Channel Design? Venting? Lubrication? That's enough for today.